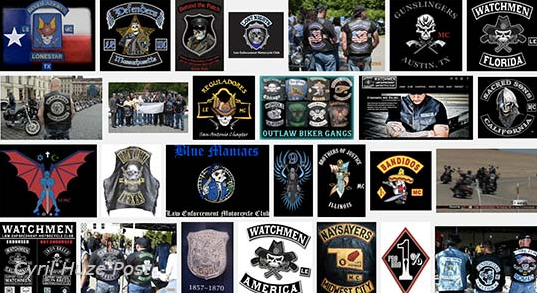 Note: Want to begin keeping track of these....gangs.. please contact us with any additions or corrections..
Black Dogs MC - International Police Motoclub LE MC. Based in the Czech republic. Blue Knights Arizona VI - Phoenix area. Open to all active and retired law enforcement officers who ride motorcycles. A fraternal and social family oriented organization. Blue Knights Law Enforcement Motorcycle Club: Texas VII Chapter - Houston area. Open to all active and retired law enforcement officers who ride motorcycles. A fraternal and social family oriented organization. Blue Knights Law Enforcement Motorcycle Club: England X Chapter - Cambridgeshire area. Open to all active and retired law enforcement officers who ride motorcycles. Blue Knights Law Enforcement Motorcycle Club: Pennsylvania IV Chapter - Pennsylvania IV rides from the Berks/Mont area of Southeastern Pennsylvania. Membership is open to all active and retired law enforcement officers who ride. Bounty Hunters M/C - info to be posted soon. Choirboys LEMC Arizona - A non-profit Law Enforcement Motorcycle Club supporting the survivors of fallen police and firefighters. Choirboys So. Cal Region 1 - San Bernardino, California club for Law Enforcement Officers who ride Harley Davidsons. Enforcers MC - The Enforcers MC consists of, but is not limited to, members of the Law Enforcement community (including corrections officers) and individuals with military or public safety backgrounds. Hired Guns MC - 100% Law Enforcement Motorcycle Club out of the tri-state area. Based in New Jersey. Iron Crew Law Enforcement Motorcycle Club - NY - Membership open to all active or honorably retired Law Enforcement Officers who have a passion for motorcycling and belonging to a brotherhood. LEMC Law Dogs Motorcycle Club - Information about law enforcement club, membership requirements, and pictures. Lost Brotherhood MC - Nonprofit motorcycle club consisting of criminal justice personnel. Based in Arizona. Reguladores Law Enforcement MC - California club for active and retired law enforcement officiers and friends. Renegade Pigs Motorcycle club - The International Renegade Pigs Motorcycle Club is for present and retired Law Enforcement & Fire Fighters. All members must own a V-Twin Motorcycle manufactured by an American owned company. Renegade Pigs of Washington - American made motorcycle club in Washington State for law enforcement and fire fighters that promote safe and fun riding. Shamrocks MC - Motorcycle CLub for US Federal Agents. Based in Vermont. Untouchables Motorcycle Club: Indiana Chapter - Gary area. The Club was founded by, and consists of full-time and retired police officers that own and ride American-made motorcycles. Untouchables Motorcycle Club: New York City Chapter - New York City. Consists of full-time and retired police officers that own and ride American-made motorcycles. Warthogs Motorcycle Club - Hudson Valley N.Y. Chapter of the Warthogs Motorcycle Club. Open to public safety officers. Wild Pigs Oklahoma Motorcycle Club - Law enforcement motorcycle group with scheduled rides.